Unnecessarily long videos can be frustrating. You want (or feel obliged) to watch the entire thing, but you just don't have the time. Even if it's a video posted by a close friend or relative, often you skip most of the video because it just drags on and on. Sometimes you might play it in the background or possibly just leave it on while you go about your business elsewhere, but the point is you don't actually watch the video. Whether it's the case that you have other videos on your list that you want to watch or a matter of you just not having the time to watch very many videos at all, an unnecessarily long video is frustrating. So, my suggestion is to keep videos short. 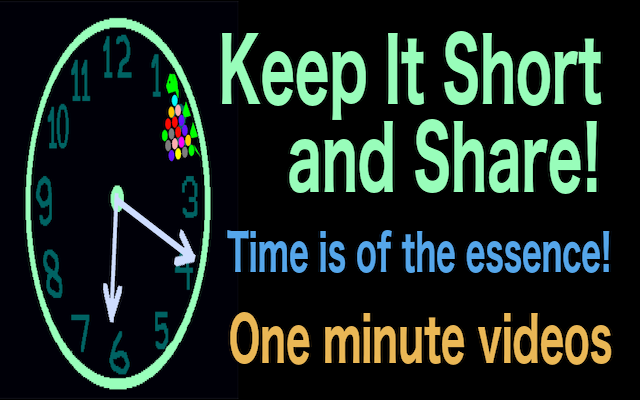 In fact, I've created a Google+ Community called Keep It Short and Share (KISS) to factilitate the sharing of short videos.